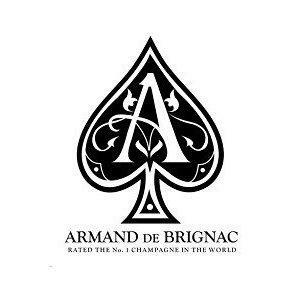 Armand de Brignac's Champagnes are marketed as flagship cuvées in selected markets. They are produced in a multi-vintage style (like Krug's Grande Cuvée) as opposed to the vintage prestige cuvées of some other Champagne houses. Like much Champagne, the Brut Gold cuvée is a blend of the grape varieties Pinot noir, Pinot Meunier and Chardonnay, making use of only Premier Cru and Grand Cru-rated grapes. Two other cuvées, a Rosé and a Blanc de Blancs (100% Chardonnay) were released in 2008. Wine & Spirits 91 "Wood tones dominate this wine when it's first opened, bringing ginger beer and a masculine, cologne-like scent to the savory, Morello cherry flavors. It develops floral aromas with air, a powerful cherry weightlessness that opens up and races past the woody curves of the finish.